(Portland, Oregon) - The area around Portland is exploding. Fall is making stuff blow up. You often need only to rumble your way through various Portland, Beaverton or Tigard streets to catch the wallop of colors. Even the park blocks downtown or neighborhoods around SE Hawthorne are getting into the act. It’s the rural drives that are really the kick in the eye, however, like Germantown Road or other parts of Washington and Multnomah Counties on the north side of Highway 26. Those are among the most obvious. 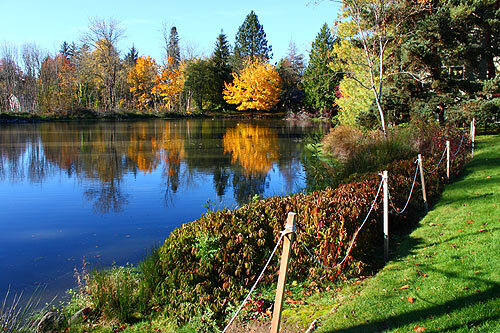 But it’s the less obvious routes that can yield the biggest surprises, like simply getting lost somewhere between Hillsboro, the coast range, wine country and parts of Beaverton. Somewhere off Farmington Road, not far from where it meets River Road or the long, winding stretch that leads to Newberg, it’s easy drift off course. Small roads with names like Iowa or Simpson become a twisting, almost white-knuckled jaunt through vast rural farmlands, and vistas that can reveal Mount Hood on the especially sunny days the Portland area has had recently. These roads and their surrounding hills can remind one of the rolling landscapes of Ireland or even Germany’s Black Forest area. 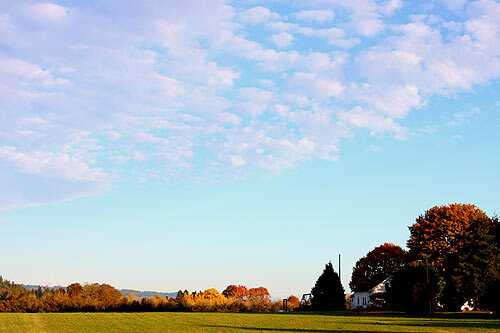 Europe entered your imagination for a while, until some distinct element of farmland Americana smacked you in the head and out of that reverie. 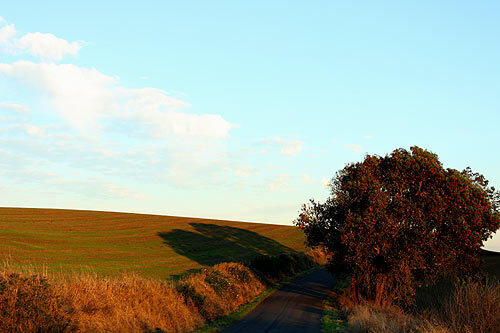 It’s here where the unusual autumn sights come into view. Loads of vineyards fill the windshield, belonging to mysterious wineries you usually can’t the names of, and if you can, you often haven’t heard of them. Oak Knoll Winery was one recognizable one. The rest of the time, you felt as if you were spotting new wineries that no one knew about yet – and perhaps you’d be more in-the-know than others. These vines were often bright yellow – extremely bright. At one high vantage point, another chunk of farmland, next to a large pond, exuded deep reds from still more vines – or some sort of crop. Large trees weren’t as common in this area, so those kinds of bulbous shapes filled with wild colors really stood out when they were found. Hills rise and dive into the distance with each turn out here, often painted in interesting colors themselves, like a mix of browns, reds and greens. Some are guarded by the rounded presence of massive trees that had turned color – others are not. It’s easy to not care that you don’t know where you are, or exactly when you’ll come back to a recognizable landmark like a highway sign or major thoroughfare. And on days like this, with these sights, why would you want to leave? 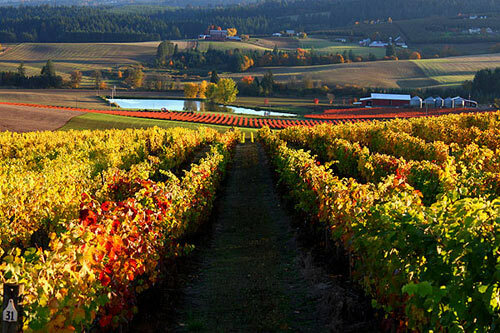 It turns out all this little getaway for the senses is near a quaint town called Blooming, and it’s an interesting mix of wine country, coastal hills, and Washington county farms. Where exactly were these photos taken? We’re not sure, really. And that’s the point. 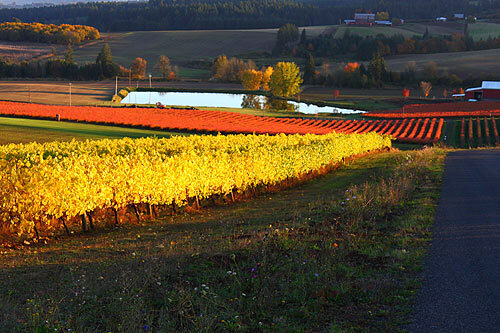 You should simply head off towards wine country and Hillsboro, forsaking the major roads, and purposefully get lost.